Paint the polar bear purple and the crowds will come. That seems to be the lesson a zoo in Mendoza has learned, after its 23-year-old bear Pelusa was sprayed with an antiseptic spray that turned her normally white fur a dark shade of violet. 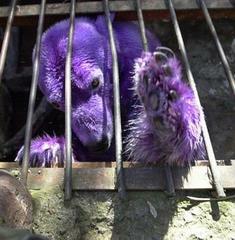 The unusual color — a temporary side effect of the treatment for dermatitis — has turned the aging bear into a minor celebrity in Argentina and prompted thousands of schoolchildren and tourists to make their way to the Jardin Zoologico de Mendoza in the western city beneath the snow-capped Andes. The spray applied to Pelusa is similar to one used by pediatricians to treat children’s scraped knees or lab technicians to stain micro-organisms for examination under microscopes. Pelusa, a 395-pound bear has been temporarily placed in a cage because of the treatment, and is separated from her mate, Arturo. She is also kept back a distance from the public. The separation, Duarte said, was needed to keep Pelusa from taking her regular plunge into an icy pool of water at the polar bear compound. That would have washed away the medicine prematurely, he said. The isolation has not seemed to bother Pelusa but it has left Arturo, a 16-year-old male almost double the weight of his mate, a bit grumpy, Duarte said. After all, the two — who have been together for years — have been kept apart for 20 days. I empathize with poor Arturo. Anyway, whoever produces stuffed purple polar bears — especially sold with a bigger, white polar bear — could make a mint right now.